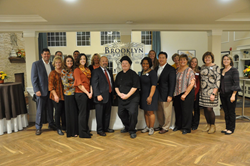 Brooklyn Pointe Assisted Living and Memory Care, a newly constructed Meridian Senior Living community, has formally opened as marked by its grand opening on October 18, 2018. Brooklyn Pointe Assisted Living and Memory Care, a newly constructed Meridian Senior Living community, has formally opened as marked by its grand opening on October 18, 2018. Located at 4800 Idlewood Drive, Brooklyn, Brooklyn Pointe is owned by Steve Nicholas of Rochester, NY and managed by Meridian Senior Living. The community offers a total of 80 apartments including a variety of studio, one-bedroom and two-bedroom apartment styles. The grand opening was heavily attended with over 300 visitors including prospective residents, family members, and city representatives including the Brooklyn City Mayor, Katie Gallagher. Guests enjoyed seeing the new community and meeting the team members amongst a backdrop of the Oktoberfest theming. Not only did the attendees gain pertinent information about the services and amenities offered at Brooklyn Pointe, they also enjoyed Oktoberfest food, décor and entertainment. Such theming included The Oktoberfest Fair provided by Hofbräuhaus Cleveland, pastries by Rudy’s Strudel and Bakery in Parma, beautiful fall foliage décor by Jindra Floral Design, ice sculptures by Elegant Ice Creations, and Oktoberfest music being performed by dueling accordions provided by Eric Noltkamper. Brooklyn Pointe is the city of Brooklyn’s first assisted living residence and is conveniently located near the Ridge Park Square shopping district, medical offices, and major expressways. Brooklyn Pointe is a new state-of-the–art Senior Living Community facility designed to provide a home-like environment rather than an institutional one with a hospitable residential atmosphere using natural sunlight in all areas. In addition to comfortable, affordable apartment homes, residents will enjoy socializing in a Grand Dining Room, a Fireplace Lounge, activity center, library, chapel, theatre room, and even a hair salon. The attractive, two- story community features stone and siding, with architectural elements like light wells and decorative windows and sunrooms that provide an abundance of natural light. A two-story ledge-rock fireplace can be enjoyed in the lounge or the neighboring bistro. A large dining room overlooks the courtyard, and the lounge features a new baby grand piano. A private dining room is designed for special family celebrations or dinner parties. The spacious activity center has a popcorn machine on wheels reminiscent of the street vendors of the past and can be wheeled into the theater room. Off the activity center is a greenhouse, so that residents can soak up some sun and nourish herbs for the chef’s use or grow their own plants. A special, separate Memory Care neighborhood for those experiencing memory loss from Alzheimer’s is also an important part of the new Brooklyn Pointe community. Specially trained staff and an enhanced activity program carefully tailored to meet residents’ needs are an important part of the program, along with family style surroundings to mirror the residents’ homes. Meridian Senior Living, LLC, a privately held company, owns and operates senior housing communities across the United States. With more than 7,000 beds, Meridian is currently the eighteenth largest senior living provider in the United States. Meridian prides itself on providing the highest quality care and affordable living options to residents in their own communities. Although large in scale, Meridian focuses its growth effort on building state-of-the-art properties in cities outside major markets. For more information on Meridian Senior Living’s Brooklyn Pointe, visit us online at http://www.brooklyn-pointe.com.